Whoever decided that the been-around-forever Oreo cookie smashed with cream cheese and covered in white candy coating tasted delicious was/is brilliant, I tell you. But I’m not going to lie, the Oreo truffle itself can be a bit time consuming and let’s face it, they’ve been around for so long, it was high time to morph the Oreo truffle into…say…a brownie! Now that’s brilliant! After seeing the general idea on Pinterest, I decided to create my own tweaked version. Basically what we have here is a simple, rich brownie, baked and cooled and then topped with the famous Oreo truffle mixture. Drizzled with white chocolate (or white candy coating if you prefer) and woila! You have the Oreo Truffle Brownie. It’s decadent. It’s sinful. And it’s seriously the newest, coolest way to enjoy the almighty Oreo truffle. Trust me, you don’t want to get left behind on this one. One Year Ago: School Lunch Solutions! For the brownies, preheat oven to 350 degrees. In a medium saucepan over low heat, melt the butter and chocolate chips. Stir constantly and remove from heat when the chocolate is fully melted. In the same pot, whisk in the sugar and vanilla. Then add eggs, blending fully one at a time. Add the flour and salt and stir until well combined. Pour the batter into a greased 9 X 13-inch pan. Bake for 20 minutes. Turn the heat down to 325 degrees and bake for 10 more minutes. Remove from the oven and let the brownies cool completely. 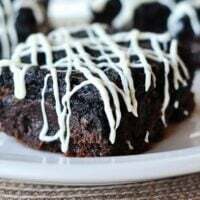 For the Oreo truffle topping, crush the Oreo cookies and mix with the softened cream cheese until the mixture is well-combined. I find the best method is to lightly crush the Oreo cookies and then mix the cookies with the cream cheese in an electric stand mixer, food processor or with a handheld mixer. Lightly press the Oreo truffle mixture over the cooled brownies. In a small microwave-safe bowl, melt the chocolate or almond bark on low power at 30-second intervals, stirring in between, until melted and smooth. Pour the chocolate into the corner of a ziploc bag. Carefully snip a small piece off the corner and drizzle the chocolate across the brownies. Alternately, you can cut the brownies into squares and then drizzle with the chocolate. Chill the brownies in the refrigerator until the chocolate is set (10-20 minutes). Cut into slices and serve. In my opinion, these brownies taste best chilled but you can also serve them at room temperature. Yowza. These are delightful. Everyone asked for the recipe! Could I make these into mini muffin pan brownie bites? Oh, Mel! I am so glad I came across this recipe when I was searching through your brownie recipes for inspiration. I made them for our Sunday family dinner and holy moly! To say these were a hit would be a MASSIVE understatement! THEY ARE BOMB! All my siblings made me send them the link right then and there. Thank you! We will definitely be making these again and again! Logan – Yes, I think they would keep well in the fridge just fine for a couple days. What kind of white chocolate do you use? Because I’ve tried 3 times now with 2 different kinds of white chocolate and neither of them were “drizzle-able”, all 3 times the bags busted out at the seams because the white chocolate will not melt into a liquid. Amanda – I’ve found that white chocolate chips don’t melt very well so I almost always use the white baking bars (found by the chocolate chips). I can usually find the Baker’s brand in my area. It was pretty good! It’s not so much a brownie texture, more of a chess square maybe? But it has a really good flavor! This is the recipe I use all the time for brownies! I was wondering… have you ever used a different flavor “chip” for making just the brownie layer alone? I was thinking about using butterscotch chips today. I hope they turn out good! Hi Casey – nope, I’ve never used a different flavor of chip for the brownies. Good luck if you try it – keep in mind that many other chips don’t melt as well as chocolate chips. Woah! First of all, great and easy brownie recipe! I lined a glass 9×13 with tinfoil, baked as instructed and they came out beautifully! Perfect! My kids and I just made the oreo truffle mixture, pressed it on gently by hand as another commented suggested, then melted my chocolate chips in a ziploc bag and squished it around at 30 second intervals. . . one less bowl to clean. Um, these are ridiculously delicious! It tastes like some cheese-cake-brownie dream or something! Thanks so much! We ALWAYS love your recipes! These were a HUGE success for my son’s birthday today. My husband (who refuses to eat cake on account of it being dry) informed me that I can make these for his next birthday. Love, love your recipes, Mel. Thanks for helping me feed my family with style and ease. And your commentary! Let’s just say you make me chuckle so often. When I read this I thought “these look SO good. I definately shouldn’t make them.” Well, I did anyway. First I opened my bag of chocolate chips and they were MOLDY! Really, moldy??? Whoever knew chocolate chips could mold, but they did. At that point, once again I thought, “maybe I shouldn’t be making these.” Later as I was crushing the oreos and the ziplock bag burst open showering my kitchen with oreos I again thought “maybe I shouldn’t be making these”. I proceeded anyway. After crushing more oreos and leaving the kitchen for a bit I came back only to find that my 1 and 4 year old boys (and another male that lives at my house that I won’t name, but is the one that is supposed to be a good role model to the little ones) had eaten them. I crushed more while thinking, “I shouldn’t be making these.” I continued on though and then as I single handly ate half the pan I once again though, “I really shouldn’t have made these.” Was it worth it though? Every single bite was definately worth it! 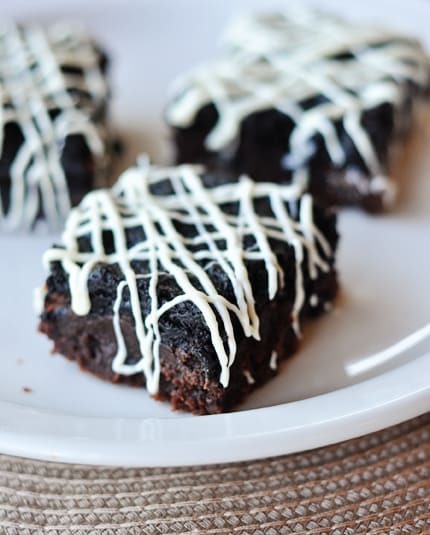 @Lisa – i made these tonight using a box mix for the brownie portion…worked great! and as far as spreading the oreo topping, i just used my hands (washed of course) and patted it down. @Laura, I just found a place where I can get them on the internet. But I will be sure to check out the British Shop as I have an upcoming trip to Malmø planned with my daughter, her schoolfriend and the friends mother. I’ll take them with me to visit that shop too, Thanks for your help. This is wrong on all levels and I absolutely love it!! Just made this recipe, i love your blog all the way from austalia and so do many of my friends and family beacause l share the food with them… I had trouble spreadimg the oreo layer though. These sound sooooo tasty!! Love this recipe! As a full term pregnant woman, I’d just like to say that I LOVE YOU! Oh my goodness… what an amazing idea! YUM! 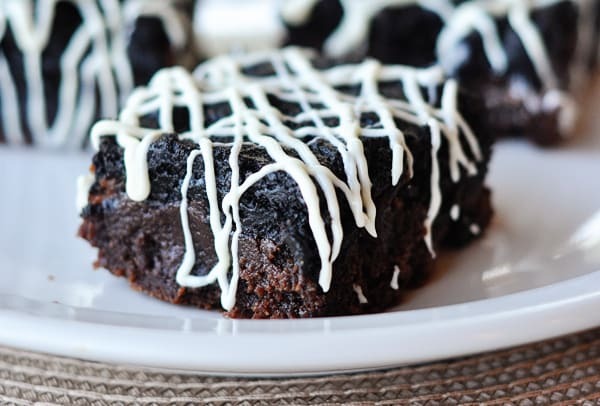 Oreo brownies = genius! Oh…MY…Goodness…these sound and look so good and perfect for my love hate addition with oreos 🙂 Can’t wait to try!!!! Oh, these would be devoured in no time at my house! Can I love you and hate you at the same time for this recipe? **made your banana bread this week and it was loved by all and eaten in one day. then I FINALLY made some real yeast bread from your recipe and it turned out and was eaten in the same day. Now I’ll have to make these so they can be eaten in the same day. I’m seeing a theme here…..
Ummm look so good. Sadly I do not think that I can get chocolate chips here in Denmark. Would love to make these. Oh my gawd yes! Pure genius! Pining now, to make today! My son will die over these since Oreos are his all time favorite cookie, which is really sad because I have some mad cookie baking skills! These might be just the tool to lessen the “you need to go mow the lawn” struggle. I’ll be making these this weekend! We had your broccoli salad yesterday and it was so good that I had some for breakfast this morning. Oreo truffles are the bomb! I just made cookies with an Oreo truffle swirl – I guess I’ll have to whip out the Oreos again and make these brownies! These brownies look so inviting! I love your recipes. I check your blog weekly. These recipes are practical for me, and I love that! Thank you for a wonderful website!